Gross height 89.5,gross width 64.0 cm. Excavated in Huang-Kang-hsien,Szechwan.The rubbing is based on a replica of the original stone made in the Ming dynasty. 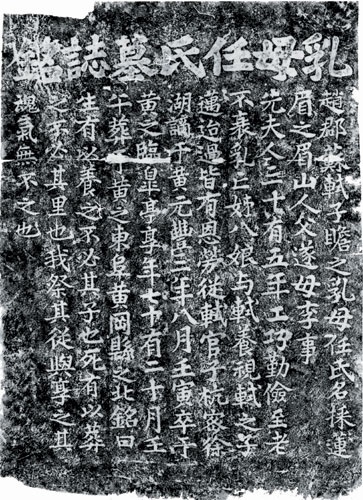 This inscription was composed and handwritten by Su Tung-p'o. Wet-nurse Jen, the tomb occupant, foollowed her mistress into the Su family, where she got married and nursed Tung-p'o and his sister. She also attended to Tung-p'o's three sons and one grandson. This inscription enables historians to shift their focus from great men to ordinary people.